Arrogant, talented Dan Millman seems to have the perfect college life: a stunning gymnast's body of incredible strength, handsome looks, good grades, plenty of money and a shot at the Olympic qualifiers in men's gymnastics. Still, Dan wakes up almost nightly from terrifying nightmares and odd visions he can't explain or dismiss. One night, awakened by yet another nightmare, Dan goes for a run through his foggy neighborhood and comes upon a well-lit service station. Behind the counter, an old man seemingly moves without regard for space or time. One moment, Dan is paying for his snacks, the next the old man is on the roof of the station. Stunned by this impossibility, Dan begs the old man, whom he instinctually names Socrates, to share the secret of his abilities in order to achieve his goal of Olympic Gold. The old man puts him through a regimen that changes his diet, training, and lifestyle. Before long, his life is ruined, and he loses his friends, his girls, and is almost thrown off his Gymnastics squad. Thus begins a journey of discovery for Dan that will shatter every preconceived notion he has about academics, athletics, and achievement. Guided by Socrates, Dan will consider a whole new ideology-one that values consciousness over intelligence, strength in spirit over strength in body. But in order to succeed, Dan must somehow let go of all of his expectations - and simply live in the now... Based on The Way of Peaceful Warrior, Dan Millman's best-selling spiritual memoir, PEACEFUL WARRIOR explores the highly competitive world of men's gymnastics, while introducing an astonishing philosophy that awakens the human spirit. 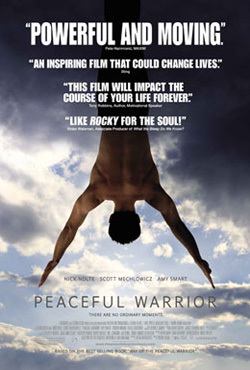 A celebration of the achievements made possible by an open mind, PEACEFUL WARRIOR is a sports movie not about imagined perfection or victory - but about heart.